I wanted to have fun with the upcoming Halloween n Fall seasons. 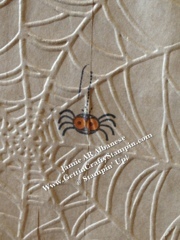 I snagged regular brown bags for lunches and ran it through the Spider Web Folder and my Big Shot. I love this look and do it for my kids when they have field trips!! My girls get flowered bags, my son gets this web or stripes, etc. they are the envy of all their friends on their trip!! 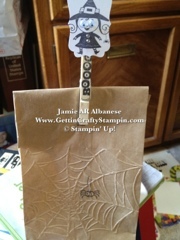 With our Googly Ghouls stamp set I stamped the lil girl with the witch hat and mini spider web on a Very Vanilla. I highlighted her with our adhesive backed rhinestones, and NEW Googlies (cute eyes!). 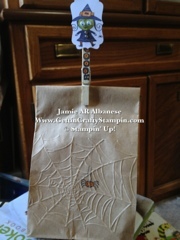 I stamped the larger spider on the bag before embossing the web with the Big Shot. 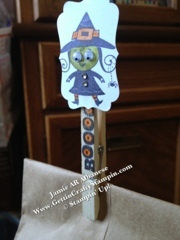 Stamping the Boooo on my wood clothes pin, colored all the eyes in with Pumpkin Pie ink. I colored the girls face in with Old Olive and her accessories with the Pumpkin Pie ink. 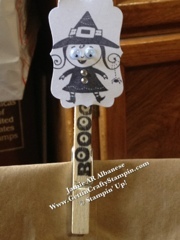 Loveee our Stampin' Write Markers!! (I'm just saying...). 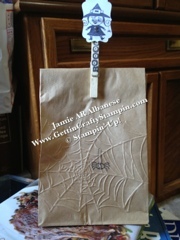 I adhered the girl (after punching with our Decorated Label punch) with a Stampin' Dimensional adhesive and BAM! 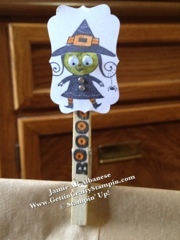 Cute, easy andddd Fun!! I plan on filling it with fake spider webs and a lil present!! I hope you have fun with your Paper Bags!! Lol the Holidays are right around the corner... EEK!! You definitely ARE the fun mom!!! What a cute idea!! So cute & such a great idea! Thanks for sharing. Thanks Kelly!! I'm beyond excited and honored! !